The magnetic fishing toy has lots of different fish toys, kids will play with parents and their friends. Super funny fishing game will promote kids’ eye-hand coordination, learn how to fishing, and increase friendship and interaction. Reasonable length and lightweight, it is easy for toddlers to firmly grip the smooth comfortable anti-slip cute handles. The fishing toy can be placed in the water, either also be a decoration, resistant to compression. A variety of different colors and types of fish, cultivate children's practical ability and agility, improve children's vision and observation. The toy has magnetic, can cultivate children's concentration and hand eye coordination. 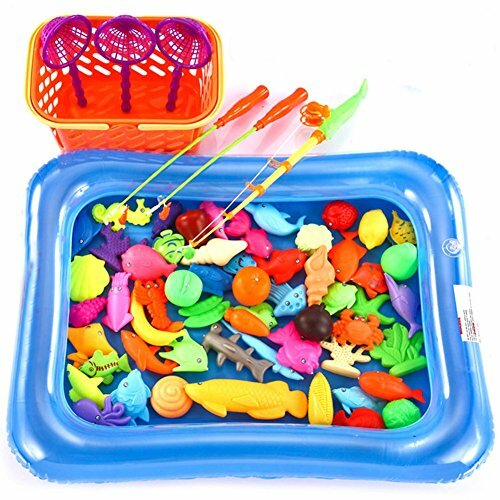 Fishing toys is a good choice! Kids play with friends or family, have funs with it, and it also develop children's brain, exercise the patience. If you have any questions about this product by O-Toys, contact us by completing and submitting the form below. If you are looking for a specif part number, please include it with your message.